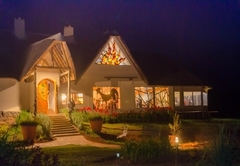 Antbear Lodge is a highly recommended Giants Castle Bed & Breakfast providing accommodation in 15 guest rooms for tourists visiting the Drakensberg region. 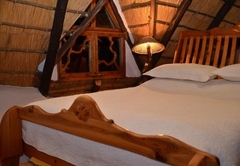 The Antbear Lodge is situated in the foothills of South Africa's KwaZulu Natal Drakensberg. 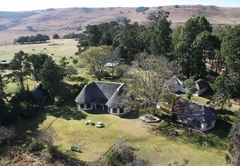 The guest house overlooks the Bushman's River Valley with one of the most spectacular views of the high Drakensberg from Giants Castle to the Amphitheatre. A breathtaking view of 160 km. 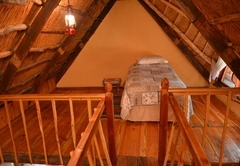 The Antbear Lodge is an ideal place to base yourself while you explore the Drakensberg and Natal Midlands. 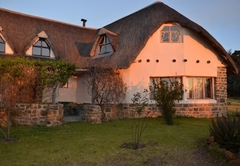 The Guesthouse is a thatched, whitewashed cottage built high on a natural platform overlooking the Bushmans River and Giants Castle. 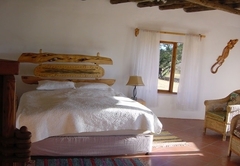 It is a bit off the beaten track and is more of an insider tip than just another bed and breakfast. 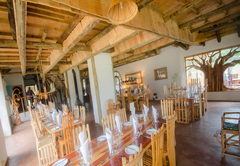 It caters for small intimate groups and never have more than 12 guests at a time. 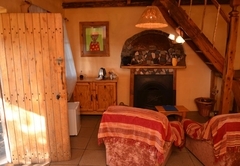 It’s a laid back, lovingly cared for kind of place where you feel a sense of happiness and peace. 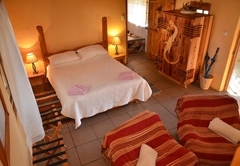 The Antbear Lodge has six double en-suite bedrooms. 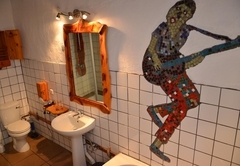 Each room is differently decorated with uniquely eccentric and artistic wooden furniture. 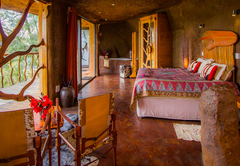 The luxury room has its own private lounge and a fireplace and its bathroom includes a jacuzzi spa bath. 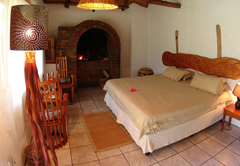 Another en-suite double consists of a loft overlooking a private lounge with a cozy fireplace. 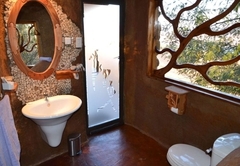 Of course each bedroom has its own en-suite bathroom, and there is a main lounge and dining-room for your exclusive use. 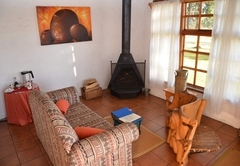 The kitchen has a fireplace which makes for an exciting cooking alternative. That rustic country feeling has been kept without losing any comfort. Plan for slow and decadent dinners by candlelight prepared by your hosts Andrew and Conny. Sometimes it’s a Moroccan spread including a genuine Moroccan tagine prepared on wood coals or maybe it’s a surprise of just how delightful Chinese food can be. 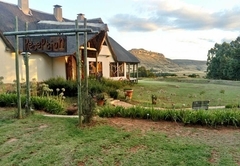 Breakfast is served with freshly baked bread and scones and often it becomes a 2 hour affair. There is plenty to do in the area too. 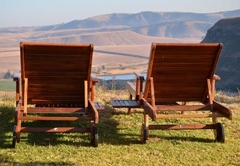 We encourage guests to go for walks right here, and picnic baskets can be arranged for a light lunch on the hill. 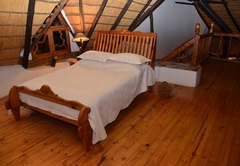 Of course there is plenty to do in the area but if you want to lie back and chill thats's a great option too. 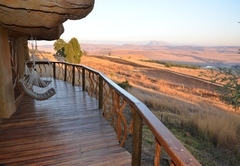 The Southern Drakensberg is as easily reached from the Antbear as the Northern part. Why not go on a day trip to the Sani Pass, if you have a 4x4 then it makes for wonderful driving. 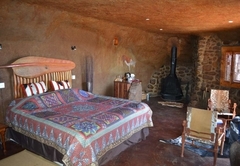 So if your looking for a place where art, beauty and time away are important then Antbear Lodge is worth a second look. 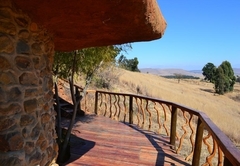 Whichever way you decide to explore our area your journey will pass through some of the most inspiring landscape and wildlife areas in South Africa. 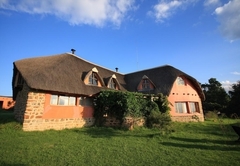 Antbear Lodge is one of the few pet-friendly places in the Drakensberg. 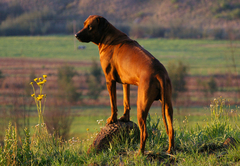 Beautiful, vast views of the Drakensberg with plenty of ground for dogs to roam. Walk for hours. 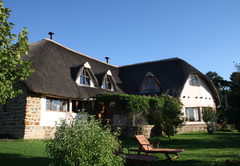 Your dogs will be happy with lots of dams to swim in and horses to discover. 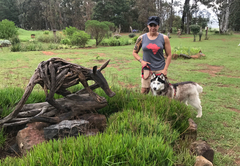 Two of the accommodation units at Antbear Lodge are fenced in, making it easy to leave your dog behind if you would like to explore some of the sights where pets are not that welcome. 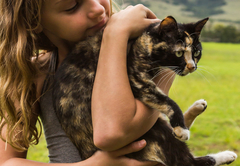 We don't have a policy that requires your pet to be on a lead as long as you know your dog won't chase our sheep, chickens, turkeys, ducks, cats, horses, donkeys, cows, and two pigs. 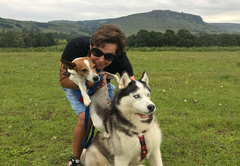 We also have two dogs of our own. Please bring your own dog food, bowls and bedding. Response timeAntbear Lodge typically responds to requests in 5-10 minutes.